Excellent financial risk management requires maximum coverage, high accuracy and precise timing. While other credit reporting companies excel with broad coverage of private companies, CreditRiskMonitor shines brightest in the public company landscape. With corporate debt now exceeding a record $6.2 trillion – and growing – astute risk managers are prudently monitoring their exposure to public companies. Risk professionals are often surprised that about 53% of all trade dollars are tied to public companies. Public companies tend to be larger than private ones, which is part of the reason for this astonishing figure. Further, many public companies also own private companies, resulting in a parent-subsidiary relationship. When a parent public company files for bankruptcy, the private subsidiaries can file for bankruptcy too. Take for instance, the Elder-Beerman Stores Corp., a subsidiary of The Bon-Ton Stores, Inc. When Bon-Ton filed for bankruptcy in February 2018, so did its subsidiaries, including the Elder-Beerman Stores. CreditRiskMonitor provides commercial credit reporting on more than 58,000 public companies globally. The FRISK® score is updated daily and measures financial stress and bankruptcy risk with 96%* accuracy. CreditRiskMonitor also continues to expand its coverage on private companies, spanning more than 80,000 businesses. Subscribers use our service and another platform to monitor all of their suppliers, customers and partners. Some credit reporting agencies look at aggregate payment behavior, judgements and liens to measure company financial risk. While these factors provide insight on risk for some private companies, our research shows that this approach is foolhardy when assessing public companies. Pertaining to payment behavior, the issue is twofold. Many strong corporations, such as Walmart and Apple, tend to pay their vendors slowly to maximize cash efficiency. Conversely, highly distressed operators might be more inclined to pay their suppliers on time to mask financial stress. In short, relying on a trade payment model for a public company, including the Days Beyond Terms (DBT) Index, can result in a complete miss. Furthermore, financial statements are only updated periodically. In the U.S., corporations report their financials quarterly, but for international companies, the reporting period can expand to semi-annually or annually. A lot can happen intra-quarter, let alone in the span of an entire year. Putting it all together, using financial models alone for public companies, such as the Z-score, can result in a complete miss or poor timing. Key inputs of the FRISK® score are four high-quality data components including adjusted market data, unique financial statement ratios, agency credit ratings and proprietary subscriber crowdsourcing. Each of these factors have been incorporated using disparate sensitivities and non-linear weightings. These four factors mitigate each other’s shortcomings and ultimately provide a more accurate result than any one factor alone. Together, the FRISK® score can identify financial stress with 96% accuracy in a coming 12-month period. 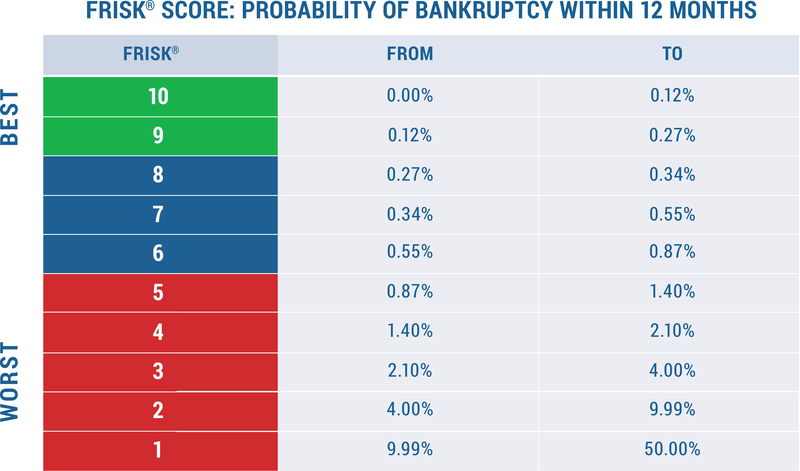 Any company in the red zone is considered to be financially stressed, and therefore has an elevated probability of default and/or bankruptcy. We recommend that any business that stands between a FRISK® score of “1” and “3” be intensely reviewed and steps should be taken to reduce exposure. If you miss a public company bankruptcy, the consequences can be catastrophic. Given corporate debt stands at record highs, more and more risk professionals are wary of their exposure to public companies. With the FRISK® score, subscribers quickly identify which of their public company counterparties are at increased risk of financial distress and bankruptcy. If a given business is in the FRISK® red zone, it is an important warning signal and should be monitored carefully. Public company bankruptcies lead to massive financial loss and disrupted supply chains; don’t let it happen to your business.